Hey, Fatima - could you lean in a bit more... oh, sorry... that's you Aisha. Okay, Salima - smile! (chuckle, chuckle). This past Sunday, the esteemed New York Times claimed - on their front page no less - that President Bush is the reason for the downturn in the economy, specifically for the disaster in the housing market. This is ridiculous and thankfully the Investor's Business Daily noticed the re-creation of reality. He [Bush] pushed hard to expand homeownership, especially among minorities," its [NY Times] lengthy front-age piece asserts. "But his housing policies encouraged lax lending standards." If the Times had said the same thing about Bush's predecessor, its story might have a kernel of truth to it. Seeking to lock in minority voters for Democrats, Bill Clinton in 1993 set a national homeownership goal of 55% of blacks, a major increase from existing levels. To achieve it, he tasked his regulators to lead an anti-redlining crusade against the banking industry that included revising Community Reinvesting Act regulations to pressure banks to adopt "flexible" lending standards for low-income borrowers. Clinton also pressured Fannie Mae and Freddie Mac to buy not just subprime loans, but also subprime securities, to meet "affirmative action" lending quotas. These actions - which were far more concrete than anything Bush did to encourage minority homeownership - were never cited in the Times' nearly 5,000 - word piece. The New York Times is not the only source of mangled and dishonest information; we have seen such bias many times over the last two years of the election system. We see the media only serves its own purposes. History is being changed and corrupted - the truth is no longer important - welcome to 1984... where history is being sucked down the memory hole and being rewritten. The honorable muckrakers of the late 1800s and early 1900s, who spent their energies investigating the prisons and insane asylums, as well as other major issues of the time did a service to us all. Rather than being the honorable writers of yesteryear, nowadays we have the Times breaking stories which undermine and destroy the United States' ability to fight the war against fundamental Islam. Is this the muckraking of today? WWSLS? What would Sinclair Lewis say? Between the deliberate and calculated deceptions being perpetrated and the destruction of history by those to whom we've given our public trust - Americans have no reason to believe a word in print, or an image on the screen that purports to be "news" or "investigative journalism". True journalism is dead. Honesty in the media can be assumed gone. Welcome to the new Ministry of Truth. I picked up the Financial Times this past Thursday, December 4th and was reading through the paper when one of the articles headlines caught my eye, "Rice urges India to foil repeat attack". How funny is that? Does anybody think that India wanted these attacks to occur, or even want that massacre to happen again? The subtitles go on to say that "New Delhi blames Pakistan controllers" and "Concerns that some militants remain". India has owned up to its own intelligence failures. That being said, Secretary of State Rice could better spend her time talking and putting pressure on neighboring Pakistan for not being more forthcoming when asked for help when tracking al-Queda members and other terrorists. Rather than "urging" the victim country to do more, it seems to make more sense to take a close look at the country from where the terrorists that perpetrated the horrific crimes came. Is this United States policy? Is U.S. policy to blame the victim for the crime against him? If we are unable to name correctly who is at fault for the murder of over 172 innocents, six of those being especially targeted (Jews) -we are all in trouble. This may be the case since the article uses the word "militants" - while Rice is quoted using the label "extremists". We are at war. To be unsure of who our enemies are, or being unwilling to name them is dangerous. Allah Akbar was shouted at the Jewish Chabad House as the terrorists massacred those inside. To not be willing to name the terrorists as Muslims is dishonest to those who murdered in name of Islam and dishonest to those who were murdered. We are at war, it's time to recognize that fact. ...listed on Obama's transition Web site as part of the team reviewing national security agencies. Her duties, according to the site, will be to "ensure that senior appointees have the information necessary to complete the confirmation process, lead their departments, and begin implementing signature policy initiatives immediately after they are sworn in." In short, she is part of a team that is likely to work directly with Clinton, a potentially awkward situation for the two women. While it may be fun to watch the fireworks, it is more interesting to think about why she's been brought back into Washington. Power has compared Israel to Rwanda - suggesting that the United States should "intervene" in Israeli politics in order to protect the Palestinians from "genocide". It is worrisome to me to think that perhaps President-elect Obama is continuing in his perspective that it is Israel that is the problem in the Middle East and not Muslim terrorists. Don't forget, Obama still has Zbigniew Brzezinski as an advisor. Yes, the same man who thinks that the "Israel Lobby" in the United States is the biggest obstacle to peace in the Middle East. While the election may be over, and it is clear who won - it will also become clear to us all what Obama's perspective and possible policies will be when dealing with Israel and the Middle East as a whole. I'm holding my breath. Jews are some of those being held by Muslim terrorists in Mumbai, India. Rabbi Gavriel Holzberg and his wife Rivka have been seen unconscious but alive after the Chabad center in the Nariman building was invaded by the terrorists. Information is sketchy but it seems that the couple's two year old son and the cook were allowed to leave the building. There may be up to six more Israelis also being held hostage. Chabad Lubavitch is a movement made up of Jews that follow the teachings of the late Lubavitcher Rebbe Menachem Mendel Schneerson. Many of these Chabadniks have spread around the world in order to give Jews an opportunity to explore their Jewish roots and heritage no matter where they might live. They truly believe in the Jewish concept of loving your neighbor as you love yourself. We pray for the safety of Rabbi Gavriel and his wife Rivka along with all those who are being held by these terrorists. Their Jewish names are Gavriel Noach ben Freida Bluma and Rivka bas Yehudis. Please take a moment to say Psalm 20, traditionally said in times of trouble. Are We Looking for Another Middle East War? 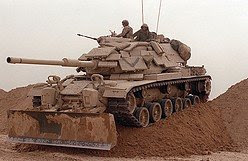 The United States is planning to sell the M60 tank to Lebanon. Is this a good idea when Hezbollah runs the place? We are tired of fighting, we are tired of being courageous, we are tired of winning, we are tired of defeating our enemies. These words, spoken by Prime Minister Ehud Olmert in 2005, baffle me and should baffle everyone. The main function of government is to protect its citizens. When the Prime Minister of the country has effectively given up on ... everything, it's time to move on. If nothing else, anyone can see that the State of Israel has its problems with security. It is constantly under attack from its surrounding neighbors and even from those within it. The Gaza Strip, while no longer under Israel's control, has gone ahead to become a official terrorist state. Hundreds of rockets fall on the cities of Sderot and Ashkelon (unreported of course), and no one cares. While we in the United States discuss the economic situation we find ourselves in - should we bail Company A out or Company B - Israeli discussions center around the issues of dividing the capital city, or evicting Jews from their homes. Should Judea/Samaria be given to terrorists? Can we trust the Syrian President Assad to keep the peace if he's given the Golan Heights? These are all serious questions, but they all come back to the question that has never been answered by any government since the beginning of the State: Is Israel a state of Jews - or a Jewish State? It cannot be both. 60 years later we see now what the results are of this schizophrenia - just take a look at Ehud Olmert. A Jew does not push out another Jew. Tell the nations of the world: Go to Hell! G-d gave us this Land. I took this photo a couple summers ago in Israel. Nothing has changed, other than who occupies the musical chairs of the parliamentary government called the Knesset. Elections are coming soon - let's see who sits where when the music stops. The New York Times has a knack of giving away sensitive information, like where our troops are operating. It's a good thing we're not at war or anything serious like that. 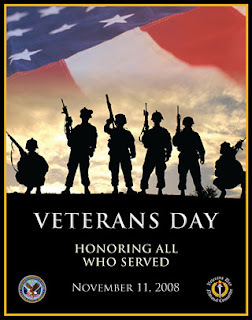 Please take a moment today to thank those who think of more than just themselves. In honor of those who serve I am including links to some great organizations that do a lot for our servicemen and women. Feel free to make a donation on this special day. The Marines. 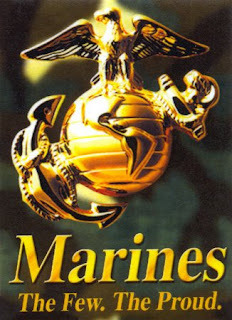 Established November 10, 1775, the United States Marines have fought in every American armed conflict since. We honor their service today. No matter how problematic Obama's policies are, Americans can be proud and excited about having elected our first black man to the office of the Presidency. This certainly is an historic moment. What I am most excited about is that the excuses are gone. American blacks can no longer say that they are unable to reach the highest office of the land. There is no longer a "glass-ceiling" getting in the way. Therefore, it is certainly time to get rid of the affirmative-action policies that hold African-Americans back. Affirmative-action may have been necessary 50 years ago, but not any more. Affirmative-action is not a positive for blacks. Seeing a black student at Harvard, one might ask themselves - did they work for that spot in an such a prestigious university or was it given to them? It is unfair to that student for anyone to have to think that way... especially when it is their own hard work that got them there. On the other hand, it is also unfair to that student, through affirmative-action policies to be given that opportunity and fail when they are placed somewhere where they are unable to seriously compete. It is time for African-Americans to take a look at their own communities and see that it is not the "white man" holding them back, but their own sense of victimhood and the breakdown of the black family. They can now look at Barack Obama, our new president-elect and see for themselves that it is hard work that brings you the results you desire, and nothing less than incredible hard work. What went wrong? Why did Senator McCain lose the 2008 election? 1. John McCain tried to play nice. He didn't attack Obama on almost anything important. He didn't attack Obama and the Democrats for the economic crisis we find ourselves in today. Rather, he allowed the Democrats to attack him - when he had been one of the first to warn about a meltdown occuring. Beginning during the Clinton years, banks were required to give loans to high risk buyers with bad credit in order to keep high ratings with the government. Furthermore, the Democrats were the ones who were in bed with Freddie Mac and Fannie Mae. There was a bill that had been brought forward back in 2005 that would have helped avoid our current catastrophe - but the Democrats killed it. But why? ... we now know that many of the senators who protected Fannie and Freddie, including Barack Obama, Hillary Clinton and Christopher Dodd, have received mind-boggling levels of financial support from them over the years. 'Nuff said. McCain also didn't attack Obama on all his radical associations (I've said enough about this, see below). 2. Senator McCain did not clearly identify his policies for the future. He needed to have picked four things he would do (at the same time explaining Obama's position) and repeat them again and again. * Finding domestic sources of energy/Slamming Obama for not being interested in nuclear power alternatives and domestic coal/oil/shale. * Emphasizing his foreign policy credentials/Slamming Obama for lack of credentials. * Explain how he's worked with the Democrats during his time in office in order to create real reform in Washington DC/Explain how Obama is not a real reformer or bi-partisan. * Plans for the Economy - Lower taxes for small business and families, reform of the health care industry and insurance/Explain how it is impossible for Obama to return money to 95% of the American people when 40% of them don't pay taxes to begin with, and showing that small businesses would be in deep trouble under Obama. McCain was unable to clearly define his vision. Obama with his mantra of "Change" (whatever that meant) was enough to carry him through. 3. The Media was completely rooting for Obama since the primaries when he was in a battle for the nomination with Hillary Clinton. Remember back to the Saturday Night skit poking fun at the mainstream media for throwing him softball questions... Are you comfortable Senator Obama -or- can I get you a pillow? The media took offense but did nothing to fix the situation, and it only got worse. Even some journalists have come clean about this bias. The traditional media are playing a very, very dangerous game -- with their readers, with the Constitution and with their own fates. The sheer bias in the print and television coverage of this election campaign is not just bewildering, but appalling. And over the last few months I've found myself slowly moving from shaking my head at the obvious one-sided reporting, to actually shouting at the screen of my television and my laptop computer. But worst of all, for the last couple weeks, I've begun -- for the first time in my adult life -- to be embarrassed to admit what I do for a living. A few days ago, when asked by a new acquaintance what I did for a living, I replied that I was "a writer," because I couldn't bring myself to admit to a stranger that I'm a journalist. This bias in the media has been found in research done by Pew Research and Project for Excellence in Journalism so it shouldn't truly surprise us - but it does and it is a disappointment. It is time to say good-bye to the pretense of an "objective" media. All this being said, the 2008 Presidential campaign is over. Senator McCain did not run a great campaign, while Senator Obama did. I congratulate Obama on a well run race. Even though I extend my congratulations to him and his supporters, I am still concerned with regard to his perspectives on many, many issues. I look forward to seeing his Cabinet picks and domestic/foreign policy advisors. Senator John McCain is a very honorable man who has spent his entire life in service to this great country. While I have never seen eye to eye with his ideas, I respect someone who sees himself as a servant of the people and not as one who sees America as inherently flawed, that no one else but he can fix it. He embodies the famous words of President John Kennedy, "Ask not what your country can do for you, but what you can do for your country." I wish Senator McCain all the best as he heads back to the Senate, and pray for Senator Obama that he do the right thing when it comes time for him to lead the United States for the next four years. Senator Obama wants to kill the coal industry in the United States. He's stated it himself as has Joe Biden. It is also interesting to note that Obama plans to use the power of the government itself to punish anyone who wants to be involved in coal production. This is a dangerous move. It is not the government's job to decide which industries should live and die. It is also important to note that many of our states depend on the coal industry: Pennsylvania, West Virginia, Ohio, Kentucky, Texas, Wyoming, Colorado, Utah and Montana. Coal also contributes almost 50% of power produced in the United States. Until we are able to find alternative energies (and jobs for those who work in the coal industry) it is foolhardy and counter-productive (understatement of the year) to attempt to destroy this important industry. Who is rich? It sounds like an existential question - but it's not. Obama and the Democrats keep redefining what "rich" is. First it was $250,000. Now it's down to $50-70,000. This is the problem when you run an election based along the lines of class warfare and envy. Who is rich? Who is poor? What can the government do to spread the wealth? Paying taxes is patriotic. Not being interested in paying high taxes makes you "selfish". This is the Democratic platform put forth by Obama and Biden. Working hard and being successful is not part of their figurings. If you have money - they'll be happy to take it from you. Obama keeps repeating that he's going to give a money back to 95% of the American People. That's great, except that 40% of the American People don't actually pay taxes. Hey, that's what you call "spreading the wealth" right?! Who Paid for Obama's Harvard Education? Percy Sutton, former Manhattan borough president, has given an interview explaining how he came to meet Barack Obama through a third person. This person is Khalid al-Mansour, a black Muslim and mentor to the Black Panthers of the 1960s. Sutton claims that al-Mansour was raising money to help send Obama to Harvard. Al-Mansour is also an advisor to Saudi prince Alwaleed bin Talal who was generous enough to offer $10 million to help rebuild Manhattan after the terrorist attack of 9/11, while at the same time blaming Israel and American's pro-Israel policies for the attack. Mayor Guiliani had enough sense to not take the money. But we have to wonder why a person such as Khalid al-Mansour took an interest in Barack Obama. We will never find out since the media does not care about digging into Obama's background. I have been doing a lot of writing on issues regarding Senator Barack Obama. I am adding links to these articles here from earliest to latest. I recommend reading them before going to vote this coming Tuesday. If none of these issues bother you - go ahead and vote for Obama. If they do make you wonder about him - please reconsider your support for him. I received this story from a friend. It made my day! This happened to a good friend of mine, told to me this morning. A friend of mine who is a huge McCain/Palin supporter and also happens to be gay was on a very crowded bus headed for Queens. He had a number of McCain/Palin campaign buttons pinned to his work bag. All of a sudden this moonbat in his late 40s with long greasy hair and a black trench coat stands over him and starts eyeballing the buttons on his bag and begins to mutter to himself. My friend asked him if he had a problem and the moonbat said something about those 'ugly buttons' and how he's been brainwashed. My friend said, 'look, I don't have anything to say to you. You can think whatever you like.' The moonbat started going off about how bad America is and awful this country is. The moonbat then said, 'Then you both must be listening to those Nazis.' Then an older Jewish woman gets up and elbows her way through the crowd. She said, 'I survived the Holocaust. I lived under the Nazis.' She pulled up her sleeve and showed her concentration camp tattoo. She went on, 'You should be ashamed of yourself for comparing the United States to Nazis! How dare you!' The moonbat moved away still muttering. Clearly outflanked. Then another woman sitting nearby leaned over to my friend and said, 'Thank you. Before now I didn't know who to vote for. But if that guy is one of Obama's fans then I am voting for McCain!' The bus pulled over and through the window everyone saw the moonbat go flying out and hit cement, his bag on the ground, his papers scattered and his commie socialist newspapers blowing in the wind. Then this other guy onboard who was quiet all along said in his heavy NY accent, 'Just call me Vinny the Plumber. I do things the Queens way, I tripped the m*therf*****r! I got this email from a friend outlining brilliantly some of the problems that we have with Barack Obama. With the election only days away, I feel compelled to send this email to alert my friends, family, and others whose emails I happen to have to the danger than an Obama presidency would pose to the United States, Israel, and the world, and the necessity of electing a proven leader like Senator John McCain. Senator Obama has been very clear about how he would lead this nation; do not say you did not know. * Senator Obama opposes nuclear power in practice. He says, "before an expansion of nuclear power in considered, key issues must be addressed including: security of nuclear fuel and waste, waste storage, and proliferation" (pg.6). This means, in practice, that he opposes nuclear power. We know how to safely dispose of the waste; France does it every year, to the tune of 75% of its power. * Are you not troubled that Senator Obama is not serious about energy independence? He waxes long about solar power, wind power, and ethanol, none of which is close to being practically usable on a large scale. Yet he opposes drilling outside the areas already set aside on the Continental Shelf. Yes, I know, Senator McCain opposes drilling in ANWR. I disagree with him on that. * Senator Obama supports taxing oil companies for their "excessive" profits. Since when does the government have the right to tell a company, "You have made too much money this year. We will tell you what you may do with your record profits"? And why stop with the oil companies? Why not tell the same thing to Microsoft? Why not the trial lawyers, with their tobacco lawsuits? Why not Senator Obama himself with his book deals? Because the oil companies, who set their prices according to OPEC's price per barrel, are seen as evil and greedy. Not like the workers' and teachers' unions, who exist only for the betterment of society, right? Are you not troubled by this extreme government interference in the free market? Of a politician telling a company, "You have made too much money this year!"? 1. Despite overwhelming evidence (according to major Democrats) that Saddam Hussein had WMDs, Senator Obama is against the Iraq War. (Before you say, "Bush lied, people died!" see this LA Times article by an editor at the New Republic.) Are you not troubled that our potential Commander-in-Chief does not support this war despite a real threat to American interests, despite overwhelming evidence? 2. He then opposed the Surge. When the Surge worked (according to his own words!) he could not admit that he had been wrong to oppose it from the start (find the line of questioning that begins, "I think you were desperately wrong on the surge" and take it from there.) Are you not troubled that Senator Obama voted against a military strategy that has been incredibly successful? 3. When Russia invaded Georgia in August, Senator Obama's first reaction was to call on both Russia and Georgia to show restraint. Er? Russia invaded Georgia! Can you image someone on September 2, 1939, calling on both Germany and Poland to show restraint? How about December 8, 1941, calling on both Japan and the United States to show restraint? Later, he changed his tune, calling only on Russia to cease its invasion. Are you not troubled that Senator Obama was incapable of distinguishing the aggressor from the victim, and instinctively responded with a statement of moral equivalency? * Senator Obama has not been forthright about his position on Israel. At AIPAC he said, "...Jerusalem will remain the capital of Israel and it must remain undivided' (pg.5). Just two days later, after Mahmoud Abbas responded angrily, Senator Obama effectively renounced his statement. Are you not troubled that Senator Obama gave a sure-fire applause line to a pro-Israel gathering, only to retract it within 48 hours? Did he lie in his speech? Or is he clueless as to what an undivided means? 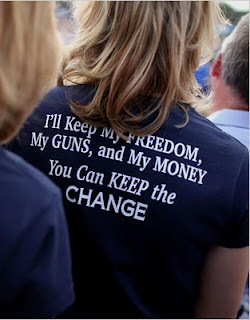 * Senator Obama has some very dangerous supporters who want him elected. He has appeared at events with people who threaten Israel with violence. Anti-American and anti-Israeli world leaders wish to see him elected. Are you not troubled by Senator Obama's ties to people who are vehemently anti-Israel? Are you not troubled by some of the world's worst tyrants hoping for an Obama victory? * For 20 years, Senator Obama sat in the pews of a church where the pastor was filled with hatred and venom for the United States. He has described this man as his mentor. He was a father figure to Senator Obama. Senator Obama even titled one of his two books The Audacity of Hope, based on one of this pastor's sermons. This pastor has accused the United States of creating the AIDS virus to kill blacks. He wishes for G-d to "damn America", and not bless it. And only when it became politically dangerous to continue to support this man, did Sen. Obama end their relationship. Are you not troubled by a 20-year relationship with a race-baiting, America-hating preacher? No one can be held responsible for every wild statement made by his or her spiritual advisor. But why would you continue to seek guidance from such a person? We know virtually nothing about Sen. Obama's character. But we do know that his close friend was Jeremiah Wright. Welcome one and all... Republicans, Independents, Democrats and anyone else wandering through. A Patriot's Journal contains my reflections on the political scene of the day. You may agree or disagree with me as you see fit and of course I appreciate any comments you may want to send my way. I believe in honesty. Honesty in understanding politics and the world around us. I believe that we need a clear understanding of issues and ideas. I believe that good character and good judgment are essential in our candidates and in our civic life. I believe in the American work ethic - work hard and be successful, and that there should be no limit to that success. I also believe in the American Republic - the Republic where we as individuals are responsible to one another, not where the government is responsible to take care of us. In other words, I believe in the Unites States Constitution and Bill of Rights (all of them). I will own up to my biases for all those who don't know me. I am a registered Independent, though I generally vote Republican. I am a conservative. I enjoy politics and read everything I can get my hands on. I have a solid understanding of the issues and take pride in the fact that my articles are better researched than most news articles I see in the mainstream press. I welcome you now to A Patriot's Journal. Don't be a stranger. Peace, Love and Liberalism - UPDATED with video! Today I entertained myself by taking up an invitation to help hand out John McCain fliers on the West Side of Manhattan. It was either doing that or doing laundry and handing out fliers sounded much more fun. And it was. I got to the meeting spot and found that rather than handing out fliers, there's a bunch of McCain/Palin supporters who were marching along Columbus Avenue from 86th to 79th and back again. They are there with two or three large American flags and McCain signs. It was quite a turnout - 60 or 70 supporters. Now the march itself was interesting. I had forgotten that on Columbus Avenue on certain weekends is a street fair made up of the different shops and merchants who come special for the occasion. We're walking along and people are booing. Yes, actually booing. People gave thumbs down and more than a few actually gave us the middle finger. I was impressed and loved every minute of it. I hooted back and gave thumbs back up to them. The best stuff was when people came over to yell at us with the same emotion that most people should save in case we had tortured and killed their cat. I will say that there were a few along the way that cheered us on. One of them came over to tell us that we were "brave". There were others who clapped and gave us the thumbs up. Since McCain is only down by 5 percentage points in New York, it seems to me that there are a lot of supporters out there who are afraid to own up to being a conservative/Republican in this city. 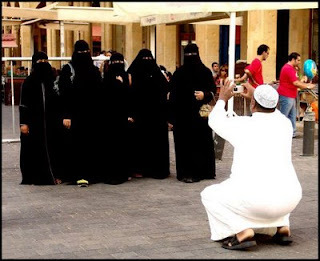 I can't say that I blame them -- in a "tolerant" city such as this I could see their perspective. However, the more people who own up to their ideology and show themselves to be unafraid of being heckled - even by wearing a McCain sticker on the way to the subway I was booed - it makes it easier for those more afraid to stand up and be counted. What was funny to me is the use of attacks that are completely baseless. "Idiots" was one. "You should be ashamed of yourself" was another. "Idiots" was funny because I was walking alongside a medical doctor, a head in her field. I, myself, have a few degrees. We're no idiots. You may disagree with our ideas, but we're not idiots. The lady who came up to me in an emotionally charged way who told me "I should be ashamed of myself" I asked her to stick to ideas and not tell me what I should feel. I asked another wonderful, tolerant person who misused his middle finger where his tolerance was. He had no sense of humor, neither did the other lady who I asked the same question. I had a wonderful afternoon. I thoroughly enjoyed myself. For the liberals out there I must ask the same question, "where is the tolerance?" I was not feeling the love. Liberals on the whole (unless someone can prove me wrong, which I don't see it possible) are the most intolerant people out there. Rather than stick to ideas and good solid logic they would rather throw words out like "scary" and "evil" instead of proposing where the other party is wrong and discussing it. But then again, maybe they are incapable of that. Today was certainly an educational day. I was on the train on my way home when a young fellow sitting there pointed to my McCain sticker and crossed his fingers. I smiled at him and nodded. Liberals have made this city a very unfriendly place for those who have a different point of view. And they call conservatives "scary"? For video of my adventure click HERE. Let the "love and tolerance" of the open-minded New Yorkers wash over you. Throughout this election, there have been numerous comparisons between Senator Barack Obama and President John F. Kennedy. Everything from their young ages to how their wives dress themselves has been compared. However, what is most important is experience when discussing the office of the president. We will very quickly see that there is nothing more than superficialities tying Obama and Kennedy together. Both Barack Obama and John Kennedy were young when they began their respective careers. Both are “firsts”. John Kennedy was the first Catholic president. Barack Obama is the first black to be nominated by his party for the presidency. Both wives have good taste in clothing (which we all know is very important for the president to do his job properly). Let’s get onto more important things… like experience. As executive experience goes - Barack Obama has a very thin resume. We know that he was a "community organizer" (whatever that means), and to top that off - not even a particularly good one either. I'm getting ahead of myself. Reader's Digest (Sept. 2008) has interviews with both Obama and McCain. They introduce Obama with a comparison to John F. Kennedy. Obama was never a governor, nor an executive. He did not serve in the armed forces or the House of Representatives. He worked in the private sector only briefly as a lawyer and was never a judge or a prosecutor. He wrote one highly acclaimed memoir, Dreams from My Father, and a bestseller, The Audacity of Hope, which is essentially a campaign book. He served for three years as a community organizer in Chicago, taught law school, served eight years in the Illinois state legislature, and ran for the Senate in 2004, winning against a fringe candidate from out of state. That experience pales in comparison with John Kennedy's life before the presidency. JFK had written two books, as well, but was also a decorated naval officer in World War II, had served three terms in the House, and was in his second Senate term when he earned the 1960 nomination. Obama has got nothing on JFK. Instead of trying to strengthen his own presidential credentials legitimately, Obama made a trip around the world in an attempt to at least look presidential. He failed in this too. Obama went to Berlin, Germany. His speech in Germany clarified his views on America. First of all, he should have given his speech in German since he is so embarrassed that Americans don't speak a second language. He was hoping to follow in the footsteps of President John Kennedy and President Ronald Reagan. Since Obama knew that their shoes were too big to fill, he instead decided to introduce himself to the crowd there “not as a candidate for President, but as a citizen – a proud citizen of the United States, and a fellow citizen of the world.” He then finished his incoherent speech (following the sentence about the September 11th terrorists with another about the melting ice caps) with the wonderful American pride he is known to show. This was a pitiful attempt by Candidate Obama to fill Presidential shoes. I heard a joke made at the time – “ordinary citizen” Barack Obama was walking by and happened to see a microphone so he decided to make a speech. Sure. That happens to me all the time, and I’m always followed around the world with anchors of the major television stations hanging on my every word. What we also hear quite a bit about is Senator (143 days worth) Obama willingness to talk to our enemies, but he’s recently tried to wiggle his way out of his own words. When asked by a reporter, Obama clarified his remarks made during a debate last summer that he would be willing to meet with the leaders of Iran, Syria, Venezuela, Cuba and North Korea "without precondition." The Obama campaign has since added nuance to that position, particularly regarding meeting with Iranian President Mahmoud Ahmadinejad. Obama said Wednesday that he would be willing to meet with any leader if he thought it would promote the national security interests of the United States, but he said there is a difference between "meeting without preconditions and meeting without preparations." I like that the Obama campaign has added “nuance”. What he wasn’t clear enough the first time? What’s so hard to understand? …he would have denied Ahmadinejad the opportunity to speak at Columbia because the Iranian president has "other forums" available to him in New York, including his speech at the United Nations. Still, Obama continued to insist that as president, he would be willing to meet one-on-one with Ahmadinejad. "Nothing's changed with respect to my belief that strong countries and strong presidents talk to their enemies and talk to their adversaries," he said. “Listening to the views, even of those who we violently disagree with, that sends a signal to the world that we are going to turn the page on the failed diplomacy that the Bush administration has practiced for so long." Obama is obviously clueless about how foreign policy works. He has also been quoted saying the now famous line, "Diplomacy is not just talking with your friends, but talking to our enemies,"
Sounds like a good sound bite, but that’s all it is. 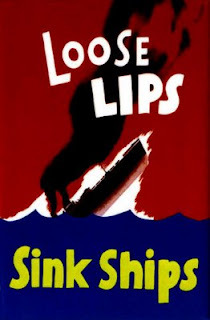 Looking weak leads to disaster, and we have history to back that up. John Kennedy himself made an error with such thinking. Kennedy first addressed the subject of a possible summit with the Soviet Union in the second Kennedy-Nixon debate. Unlike Obama, Kennedy expressly rejected a summit without preconditions.…Once in office, Kennedy more or less discarded his previously expressed conditions for a summit. In a letter written in February and secretly delivered to Khrushchev in March 1961, Kennedy expressed his willingness to meet Khrushchev "before too long" for an informal exchange of views. After the Bay of Pigs fiasco, Kennedy sensed that discussions without an agenda or prior agreement might be disadvantageous to the United States. He let the matter drop, but Khrushchev accepted the invitation on May 4. The meeting was to occur in Vienna late that spring. Through a secret Washington encounter between Attorney General Robert Kennedy and Soviet intelligence agent Georgi Bolshakov the following week, the president sought to explore an acceptable compromise on nuclear testing in connection with ongoing negotiations in Geneva that might be finalized in Vienna. The compromise, however, would have to be depicted as originating from the Soviet side. In Jack Kennedy: Education of a Statesman movie-star biographer Barbara Leaming shows a finer sense of power politics than Barack Obama does. In his back-channel offer, she writes, Kennedy inadvertently conveyed to Khrushchev "that in the aftermath of Cuba he was nervous that Vienna be perceived as a success" and that "he was willing to deceive the American people, who, at his instigation, were to be told that the [compromise offer] had come from the Soviet negotiators rather than from him. In sum, he bared his vulnerabilities to an opponent well able to take advantage of them." The parties reached no agreement on any set agenda or proposals prior to their meeting in Vienna on June 3 and 4. The meetings were therefore confined to the informal exchange of views referred to in Kennedy's February letter. By all accounts, including Kennedy's own, the meetings were a disaster. Khrushchev berated, belittled, and bullied Kennedy on subjects ranging from Communist ideology to the balance of power between the Soviet and Western blocs, to Laos, to "wars of national liberation," to nuclear testing. He threw down the gauntlet on Berlin in particular, all but threatening war. "I never met a man like this," Kennedy subsequently commented to Time's Hugh Sidey. "[I] talked about how a nuclear exchange would kill 70 million people in ten minutes, and he just looked at me as if to say 'So what?'" In The Fifty-Year Wound, Cold War historian Derek Leebaert drily observes of Khrushchev in Vienna, "Having worked for Stalin had its uses." Kennedy sought a brief final session with Khrushchev to clear the air regarding Berlin. In that final meeting at the Soviet embassy, however, Khrushchev bluntly told Kennedy, "It is up to the U.S. to decide whether there will be war or peace." Kennedy responded, "Then, Mr. Chairman, there will be war. It will be a cold winter." On this unhappy note the two leaders' only face-to-face meeting came to an end. The next two years were a disaster for President Kennedy. Khrushchev saw Kennedy as weak and took advantage of this perceived weakness. The next year saw the Cuban missile crisis. The following year saw the infamous Berlin Wall built. There is a lot to be learned here. Even being perceived as “weak”, whether true or not, can be dangerous. Things are never as simple as “diplomacy is not just talking with your friends.” Kennedy was shocked by the idea that Khrushchev didn’t care about 70 million people being wiped out in a matter of minutes. Obama has yet to notice that Iran’s president, Mahmoud Ahmadinejad, has numerous times called for the destruction of the State of Israel as well as the United States of America. This past June Ahmadinejad reiterated his call. President Mahmoud Ahmadinejad was speaking at a gathering of foreign guests marking this week's 19th anniversary of the death of Iran's late revolutionary leader, Ayatollah Ruhollah Khomeini, the official IRNA news agency said. "You should know that the criminal and terrorist Zionist regime which has 60 years of plundering, aggression and crimes in its file has reached the end of its work and will soon disappear off the geographical scene," he said. Turning to the United States, Ahmadinejad said the era of decline and destruction of its "satanic power" had begun….He added: "The Zionist regime is in a total dead end and, God willing, this desire will soon be realized and the epitome of perversion will disappear off the face of the world." The crowd chanted "Death to Israel" and "Death to America." These are not easy times we live in. I know that President John Kennedy was an honorable man who served his country fighting those who wished to destroy the United States and democracy along with it. The Nazis who systematically murdered millions of Jews with no mercy along with many more millions. I know that he attempted to keep millions of more lives safe by going to speak with Khrushchev. Kennedy did not understand that there are foreign leaders who do not care or even consider important the lives of their citizens. Khrushchev was one of those. Achmadinejad and Hezballah (the Iranian proxy) and the suicide bombers who he supports are all perfectly willing to give up their lives in order to murder others are more examples of those who don’t care about their own lives, never mind anyone else’s. Americans (presidents included) believe that everyone is like us. Everyone wants to do good for others. Everyone believes that life is sacred. It is absolutely not true. Respect for life is not a universal belief. It is a Judeo-Christian concept. It does us no good to believe otherwise. President Kennedy was a good man. He served this country honorably and had a service record to show for it. Kennedy also served in the Congress – both in the House of Representatives and in the Senate before running for President. And even with all this experience, until he met Khrushchev, he made the fundamental mistake of believing that others believe in the same sacred beliefs that Americans do. Senator Obama is no doubt also a good man. I do not doubt that he cares about this country’s future. I do doubt that he has any experience to back up his ideas. I do doubt that he understands the seriousness of the situation that we as a country find ourselves in today. The words “Islamic terror” were not buzzwords at the Democratic convention. As a result of not understanding any of this and wanting to look “reasonable” by wanting to talk to our enemies, Obama comes off very weak and puts the United States in danger as well as our allies. Obama does not have the experience that Kennedy had. Obama does not have the service record that Kennedy had. Obama does not have the political service record that Kennedy had. He has no real legislation from his time in the Illinois state legislature. Instead he points to his time as a community organizer. Obama has nothing on Kennedy. In other words… You Sir, Are No John Kennedy. Sarah Palin! A Great Choice for McCain! I've been worried about who Senator McCain was going to pick for his Vice Presidential choice but now I'm breathing easier. Governor Sarah Palin is a wonderful pick. She is middle America. Child of a school teacher and school secretary. Mother of five kids. Just celebrated her 20th wedding anniversary to a fisherman/worker on the oil fields. A normal American we can relate to. Not someone who went to a fancy school or has a lot of money. And to top it all off Palin's oldest son is headed off to Iraq. The Republicans Found Their Backbone! It's time to celebrate! For all of us Republicans we have been waiting and waiting for our Representatives in Congress to work for us. Today we have finally seen what can be done when the right thing happens. To begin with - the House of Representatives was adjourned by House Speaker Nancy Pelosi’s (D-CA) for the summer and refused to let Congress vote on legislation "to increase American-made energy and lower gas prices". House Republicans continued to give their speeches to try and find a way to make things easier for Americans to afford their gasoline going into their tanks. Speaker Pelosi went so far as to turn off the lights, cameras and microphones in the House. Members participating in the spontaneous uprising included Reps. Roy Blunt, John Boehner, Michael Burgess, John Campbell, Eric Cantor, Shelly Moore Capito, John Carter, Mike Conaway, John Culberson, Charlie Dent, Jeff Fortenberry, Virginia Foxx, Louie Gohmert, Pete Hoekstra, Duncan Hunter, Thaddeus McCotter, Mike Pence, Tom Price, Ted Poe, Adam Putnam, Bill Sali, John Shadegg, John Shimkus, Tim Walberg, and Lynn Westmoreland. “Congress should not take the next five weeks off while the American people suffer at the pump. We respectfully request that you schedule a vote on the comprehensive American Energy Act during an emergency legislative session this month." Next is the newest advertisement put out by the McCain campaign. It's brilliant. It finally attacks Barack Obama in his own words as the new "messiah"- the one who has been sent to "save" the country. Let's see how long it takes the Democrats to flip out. I'm finally excited about the Republican Party again. I've been waiting so long to see the Party finally find their backbone. It may or may not be a one-time event, but I'm excited. Here we go! When we elect a leader, we not only look at the individual – we also look at the people and advisors that they surround themselves with. Barack Obama has an interesting list of advisors and friends: Samantha Power, Zbigniew Brezinski, Robert Malley, Merrill McPeak and of course the Reverend Jeremiah Wright Jr. Let’s take a look at these people. Samantha Power is a Harvard University professor and is the Pulitzer Prize-winning author of the book A Problem from Hell: America and the Age of Genocide. She was the unpaid foreign policy advisor for Obama until early March 2008 when she quit over calling Hillary Clinton a “monster”. What is most interesting about Professor Power is not her opinion on Obama’s opponent, but rather her perspective on Israel and the Arab population within the borders. In fact, we find her thoughts clearly articulated in an interview with the Institute of International Studies at UC Berkeley in April 2002. The interview focuses on how to prevent genocides around the world. This would generally be a commendable idea except that the interviewer asks Power about the Israel-“Palestine” problem within this context of how to prevent genocides. Which leads us to ask the question – is Israel committing genocide? Obviously not. Power might not be so sure. Power actually has the nerve to draw a comparison between Israel and Rwanda. An unbelievable and amazing statement. While Israel is far from perfect – we must remember that it is a democracy. Arabs have more rights in Israel than they do anywhere else in the Arab world. Arabs who convert away from Islam run to Israel to protect them from their intolerant brothers. Arabs who are homosexual run to Israel to protect them from their intolerant brothers. Arabs who are suspected of giving Israel information on possible attacks are routinely murdered. Polls taken find that majority of Arabs living in Israel support suicide bombers. To suggest that Israel is on the verge of committing genocide is completely unacceptable. Power left the Obama campaign because of her “monster” comment. What we must wonder is why she was on his campaign to begin with. Her views are completely out of line with American foreign policy over the last 50 years. Israel has been the only friend of the United States in the Middle East. To even suggest in passing that Israel has genocidal tendencies is beyond rational thought. Does Obama support her views? If not, why was she his foreign policy advisor? Another advisor to Obama is a fellow named Zbigniew Brzezinski. When looking over his impressive resume one would imagine that he might be a good guy to have on your team, but it seems that he should have retired long before now. Brzezinski was the national security advisor to President Jimmy Carter (the same Carter whose book compares Israel to an apartheid state) and has recently written in the journal Foreign Policy that throws his support behind the book “The Israel Lobby” which accuses the lack of peace in the MidEast on the Israel lobby here in the United States for putting undo pressure on the U.S. government. “It is a tremendous mistake for Barack Obama to select as a foreign policy adviser the one person in public life who has chosen to support a bigoted book,” said Harvard Law professor Alan Dershowitz. In fact, Obama himself is trying to distance himself from his own foreign policy advisor, but hasn’t asked him to leave the campaign. It must be understood that many countries around the world have lobbies here in the United States, not just Israel. In fact, millions of Americans across the country are members of lobbies in Washington DC – everything from the AARP to the automobile unions. To accuse Israel of having a “strong-arm” lobby like AIPAC is ridiculous and underscores the gross ignorance of the situation that Israel finds itself in. No one should forget that Israel is surrounded by enemies that are still looking to drive the Jewish state into the sea. Every day there are rocket attacks that come from Gaza to Sderot and on occasion to Ashkelon. There are reports that any day now Ashdod will be within range of Gaza. Robert Malley, Obama’s Middle East expert is another one to watch. (The American Thinker does an amazing job exploring Malley ) In fact, he places the failure of the peace talks at Camp David between Barak and Arafat at the feet of the Israelis notwithstanding Barak’s offer of 90% of Judea/Samaria (West Bank) and half of Jerusalem. President Clinton himself puts the blame squarely on Arafat. So a couple of days before I leave office, Arafat says, calls to tell me what a great man I am. And I just said, "No, I'm not. On this I'm a failure, and you made me a failure. What is more important to note about Malley is what he would do in the Middle East to end tensions between Israel and her neighbors. He believes in direct negotiations with Syria and the return of the Golan Heights in exchange for peace. Never mind the connections that Syria has with Iran and Iranian proxies Hezbollah and Hamas. The same Iran that has repeatedly called for Israel’s destruction. What’s even scarier is the fact is what Malley said to the Senate Foreign Relations Committee in February 2004. In that appearance he called for the Road Map to be cast aside because incremental measures intended to build trust were unworkable. He advocated that a comprehensive settlement plan be imposed on the parties with the backing of the international community, including Arab and Moslem states. He anticipated that Israel would object with "cries of unfair treatment" but counseled the plan be put in place regardless of such objections; he also suggested that waiting for a "reliable Palestinian partner' was unnecessary. In other words, the United States should be able to force Israel to do what is best for the “Palestinians” and not what in Israel’s best interest. Again, we see the same attitude that Samantha Power had when commenting on Israel – the assumption that the United States can impose it’s will on another democratic country. General Merrill McPeak has had a very distinguished career in the United States military but should keep his mouth closed. In an interview with The Oregonian he reveals some interesting ideas. McPeak: … I don't think we have anything like a strategy for the Middle East....You know, for instance, obviously, a part of that long-term strategy would be getting the Israelis and the Palestinians together at . . . something other than a peace process. Process is not a substitute for achievement or settlement. And even so the process has gone off the tracks, but the process isn't enough. . . . We need to get it fixed and only we have the authority with both sides to move them towards that. Everybody knows that. So where's the problem? State? White House? McPeak: New York City. Miami. We have a large vote - vote, here in favor of Israel. And no politician wants to run against it. Do you think . . . there's an element within Hamas, Hezbollah, that doesn't want Israel to exist at all and always will be there? Yeah. So this is - this is multilateral. McPeak: . . . . So there's craziness all over the place. I think there is enough good will on the Israeli side - I've spent a lot of time in Israel, worked at one time very closely with the Israeli air force as a junior officer, and so - but that's maybe the more cosmopolitan, liberal version of the Israeli population - I think there's enough good will there - I don't know if there is still on the Palestinian side, because they've been radicalized pretty well. But there's enough good will, I would hope, on both sides that you can get the majority into some kind of a big tent, and make something better than what you've got now. If you do that, you'll still have radicals on both sides doing stupid things… You can handle it with police. But if you don't do that, I don't see any way to put together a strategy for the Middle East. I mean it's just kind of a linchpin . . . So not only is the United States the only one (again) who can move Israel and the Arabs to a peace agreement, but it’s only because of the Jews in New York City and Miami that are stopping us from a settlement. Liberal Israelis are good and there are radicals on both sides “doing stupid things”. And don’t forget – Israel is the linchpin to peace anywhere in the Middle East. Always a pleasant thought. Last but not least is the Reverend Jeremiah Wright Jr. We’ve all heard the racially destructive statements he’s made about damning America and KKK of A. But let’s look at his perspective on Israel. United Trinity Church’s June 2007 bulletin included a "Letter to Oprah" by Ali Baghdadi a an Arab-American activist. (Oprah had enough sense to leave this church.) This “Letter” has serious problems. It begins with the accusation of genocide. I am so glad that you will be visiting my country, Palestine. I wish I could be there to greet you. Certainly, despite the genocide and ethnic cleansing they face every hour of the day, my people will be there. Baghdadi has an amazingly skewed perspective on reality. …Jews can stay and share our land, if they wish to live in a free and democratic Palestine that respects the rights of all, regardless of their religion, race, or ethnicity. Those who refuse and insist to live in an apartheid state will inevitably pack up and return to their native lands. Yes, we have seen a “democratic” Palestine. “Palestinians” freely elected a Hamas led government – one with the platform of murdering Jews and destroying Israel. Arabs are free to live in Israel but Jews are unable to live in Gaza or Judea/Samaria without fear for their lives. How can we explain why Jews were required to relocate out of Gaza in the name of peace? How can we explain why Jews were forced out of their homes and businesses if Palestine is a “country” that welcomes all religions, races and ethnicities? Don’t miss the opportunity to drive five miles south to Bethlehem. Feel the ecstasy of entering the most dramatic cave in which the Virgin Mary delivered her beautiful Palestinian baby. Yup, Jesus was a Palestinian. Never mind the fact that Christians are being forced out of Bethlehem by the Muslims living there. Never mind there won’t be Christians living there that much longer thanks to their tolerant Muslim brothers. Arabs have always supported the dismantling of this racist government [S. Africa]. In 1962, African-Arab Sudan granted Mandela a passport to travel with to gain international support in his struggle to free his people. Libya, among other Arab states, provided Mandela and other African liberation movements, political as well as material support. As a result, Libya was designated by the White House as a terrorist rogue state. What a great honor! We all know that the Muslims are at the forefront of Human Rights. In Muslim countries around the world, women are still stoned and murdered for associating with men. Slavery still abounds in Muslim countries. In fact, we saw teenagers murdered at the Yeshivat HaRav Kook in Jerusalem a few weeks ago. And did someone say Darfur? Where's that? Oh yes, Sudan, the leader in Human Rights. Let's not forget Libya, a known terrorist entity with ties around the world. There are many more problems with the letter that was included in Reverand Wright’s bulletin that are not included here. This is nothing compared to what was in the July issue. The bulletin included an article written by Mousa Abu Marzook, a Hamas terrorist, wanted by the FBI. It defends Hamas’s platform denying Israel’s right to exist as well as supporting the attacks on her citizens. What’s funny about his denial is that he claims he wasn’t in church but not that he didn’t know about the article in the bulletin. Obama keeps denying his knowledge about Wright and his connections to the anti-semite Louis Farrakhan even though the church honored the Nation of Islam founder with a “lifetime achievement award”. Wright and Farrakhan also traveled to Libya together to meet with Muammar Qaddafi. When we look at with whom Obama chooses to associate himself we must ask ourselves – why? Why does he choose to surround himself with advisors who believe that Israel needs to be forced to capitulate to the terrorists in their midst? Why does he have a twenty year association with an anti-American, pro-Hamas, pro-Libya, anti-semite? Why did he allow his children to listen to such hate-mongering if he doesn’t believe it? Barack Obama continues to issue denials. Truth be told, it’s getting old. Words don’t mean anything. Actions are much more important. If we are to believe anything that comes out of his mouth it must alongside actions. If he is truly above politics and divisiveness like he claims – he must rid himself of his advisors, friends and mentors who are steering him in the wrong direction. If in fact his advisors and friends are only a reflection of Barack Obama and not “just” advisors… I wouldn’t be surprised either. Click here to see more on Obama and the Jews. In response to the massacre at the Yeshivat Mercaz HaRav Kook in Jerusalem, Ehud Barak, former prime minister of Israel and current minister of defense suggested that the innocents of Gaza should be moved out of harms way so that the Israel Defense Forces can operate freely and kill terrorists operating out of Gaza, never mind that the perpetrator of this attack was an Arab Israeli citizen. I like that he thinks that there are "innocents" in Gaza because as far as I'm concerned... there are none. ...The "innocent Palestinians" of Gaza and Judea/Samaria (aka West Bank) celebrated when the Twin Towers were destroyed. ...The "innocent Palestinians" of Gaza and Judea/Samaria celebrate and hand out flowers and candy on the street when there are bombings and murder of Jewish civilians. ...The "innocent Palestinians" of Gaza elected the Hamas government they currently live under. Let's not delude ourselves, the "moderate" Abbas is also a Holocaust-denying terrorist in his own right. ...The "innocent Palestinians" of Gaza and Judea/Samaria continue to have hate-filled children's television programming commemorating those who murder Jews and sing wonderful songs about Jewish blood flowing in the streets. ...The "innocent Palestinians" of Gaza and Judea/Samaria have yet to recognize the right of Israel to exist. The "innocent Palestinians" are fashioning themselves in the image of Amalek of the Torah. They have a thirst for Jewish blood - from the children who are indoctrinated with hate from the moment they're born to those who revere the murderers who spill Jewish blood to the murderers themselves. I cry for those who are truly innocents. I cry for those who have perished on their way to work on the buses. I cry for those who have perished at pizza parlors and coffee shops. I cry for those who have perished studying Torah this evening at the Jerusalem yeshiva. These new Jewish martyrs take their place among millions of other Jewish martyrs who have given their lives in order to sanctify the name of G-d. I certainly will not waste a tear on those who spill the blood of my brothers and sisters in the Land of Israel and neither should anyone else. I've been watching the Brinks Home Security commercials for a while now and I'm still as annoyed by them as I was when I saw the first one. They all begin the same way. Somebody in a house is doing something normal, like getting ready for bed or getting dressed. Then somehow those people notice an intruder attempting to break in. The intruder breaks a window, the Brinks alarm goes off and the intruder runs away. The telephone rings... and lo and behold it's the Brinks people ready to send someone to come check it out. Great commercial for Brinks except that it is completely unrealistic. Why should an intruder run away just because an alarm goes off? Maybe he will run away but there's a real chance that he won't and in fact there's a good chance that he's armed. Let's figure this out. The window is broken... the Brinks people call... perhaps it is possible to answer the phone and maybe not... it's now approximately three minutes since the window was broken. Three minutes is an incredibly long time... especially when it will take Brinks another few more minutes to contact the police and have them respond. We're looking at least six minutes. You may ask... six minutes? That's not so bad. Really? Six long minutes where the homeowner is in danger of being hurt or murdered. Six long minutes where the homeowner is completely defenseless and at the mercy of the intruder. Six minutes is also an optimistic estimate. Ask those people who live in an inner city. While teaching at Wayne State University in Detroit, Michigan I asked those in my political science classes a simple question. How long did it take for the police to respond to their 911 emergency phone call? The answer was astounding. 45 minutes or longer... or not at all. Those of us to live in the suburbs don't realize that it is not the police's job to protect us, it is our job to protect ourselves. This is not a condemnation of the police. The police are understaffed and underpaid. They cannot be everywhere as much as we may like them to be. Rather than realizing that we are responsible for our own personal security we'll call out to the intruder on the front porch who just broke in the front window, "Hey, I just called the police... or Brinks Home Security... they're on their way!" Yup, I see that working. Obviously you've figured out that I'm speaking about owning a firearm. I need to make clear that just because you have a firearm does not mean that you are necessarily going to fire it. There is the possibility of deterrence. The intruder would prefer not to get himself killed. I'll give another example regarding the police. A few months ago on a Sunday morning, about 10 in the morning I awoke to the sounds of banging on my front door. I drag myself out of bed to look through my little peephole in the door. I see two police officers, one male and one female, neither one small. I open the door and ask if I can help them. They tell me that they got a 911 emergency phone call from my apartment. I tell them that I only have a cellphone and that I hadn't called them. The officers radio back to the dispatcher to double check that they're in the right place. They were. It seems that a girl had called for help and I suppose didn't give them/or wasn't able to give them an address. I wished the officers well and they were on their way. What a scary story. A girl is in trouble and does the right thing... she calls 911. The police do the right thing by responding... but end up at the wrong apartment. What's this poor girl going to do? What are her chances when dealing with this unknown (to me) danger? Recently I've heard several times some interesting comments against self-defense with either pepper spray or a firearm. "It may be used against you." "You may escalate the situation." I cannot understand this victim mentality. So it's better to be completely defenseless?! On the off chance that the pepper spray or firearm is used against you - it's better to have absolutely no chance to mount a defense at all? The second argument "You may escalate the situation" is ridiculous. Who started the whole mess to begin with? Why is the victim the one responsible for the situation? The third argument "Learn Krav Maga/Karate." Sure, no problem. Reality check. That stuff works in the movies. 200 pound fellow versus 125 pound little ole me (G-d forbid). I don't want to be within an arms length of anyone trying to do me harm. I'm not against learning hand-to-hand self defense, but my life better not be dependent on it. So back to the Brinks commercial. I like that they're so optimistic about how home security works. The alarm sounds and the intruder runs off into the darkness. Any home security system has to be comprehensive. The alarm can be the first line of defense, but it should not be the last. Whether it be pepper spray or firearms - the homeowner or pedestrian on the street should realize that they themselves are the ones ultimately responsible for their own safety, not the police officer who may or may not show up at the wrong address. It's getting awfully hard to buy merchandise these days if you buy politically. The Middle East is out of the picture (with their hatred of all that is right and good). China is also out of the picture because of unfair trade practice toward the United States. Unfortunatly, buying American is almost impossible. Today we, political buyers, have something to celebrate. The Danish. Besides for being good to the Jews during World War II, they have decided to put it all on the line for free speech. 17 Danish newspapers are reprinting the "controvertial" Mohammed cartoon that "sparked" the Muslim riots around the world in 2006. At least 17 Danish newspapers printed a controversial cartoon of Prophet Mohammed Wednesday, vowing to defend freedom of expression a day after police foiled a murder plot against the cartoonist. Three of the country's biggest dailies were among those that published the cartoon, which featured the prophet's head with a turban that looked like a bomb with a lit fuse. The caricature was one of 12 cartoons published in September 2005 by the Jyllands-Posten daily which sparked violent protests in a number of Muslim countries in January and February 2006. What is fascinating is that if you read carefully - it took from September 2005 when the cartoons were originally published to January and February 2006 when the riots actually began. It took 5 months for the Muslim world to finally get insulted. And when Muslims get insulted we get predictable results. Imam Walid Abdul Pedersen, a Protestant who converted to Islam, said: "It's not a good idea to reproduce it and the newspapers could have defended the cartoonist differently, without resorting to provocation." "It's good to have a dialogue on freedom of expression, but you shouldn't seek out a confrontation from the start," he said. He said it was possible the reprinting could prompt "negative reactions abroad." Why do Muslim always have to hint to the threat of violence? The words: "provocation", "confrontation" and "negative reactions" are all directed toward the newspapers. Muslims around the world have to clean their own home before getting "insulted" by the world around them. Stop the terrorists in their midst. Stop producing childrens shows that show Jews and the United States as murderers. Stop threatening those who "insult" you. And stop threatening the rest of the world with destruction. That's what needs to happen. In the meantime, while we wait for the Muslim community to get it's act together, we can support the Danish for standing up and doing the right thing for Western Civilization. Look for the "Made in Denmark" label and buy their products. John McCain will be unable to honestly take this oath of office. As we've seen through his passage of McCain-Feingold and his attacks on 1st Amendment rights he is incapable to say the words "preserve, protect and defend the Constitution" without chocking. Congress shall make no law respecting an establishment of religion, or prohibiting the free exercise thereof; or abridging the freedom of speech or of the press; or the right of the people peaceably to assemble, and to petition the government for a redress of grievances. Let's begin with his attack on the 1st Amendment with McCain-Feingold. Dissenting Supreme Court Justice Antonin Scalia called it “a sad day for freedom of speech.” And so it was, because the Court’s decision upholding the McCain-Feingold campaign finance reform presages more assaults on our First Amendment rights. Let’s be clear about what a slim majority of the nation’s highest tribunal approved: The Constitution says “Congress shall make no law … abridging the freedom of speech,” but Justices Stevens, O’Connor, Souter, Ginsburg and Breyer say Congress can legally silence political speech expressed in TV “issue ads” beginning 60 days before a general election and 30 days before a primary. This is a huge blow to the 1st Amendment. 30-60 days before an election is just when the electorate is starting to pay attention to any issue. Beside for the fact that it has been established that monetary donations are considered "political speech". To limit political speech in any form is detrimental to our democratic system. Whether we like these "issue ads" are not, they are necessary. Every voter out there has the right to hear about the candidate's position on a topic. These topics range from guns to health care to children's education from both sides of the aisle. In fact, this is not a Democrat or Republican issue... it is an American issue. There are people who believe that "special interest" groups are bad news. This is a complete misunderstanding of the situation. For example: If I am an older American, while I may be retired, I do not have the time or energy to go to Washington DC to speak to my representative about issues that concern me. Instead I may decide to join the AARP, one of the largest "special interest" groups out there. I pay my annual fee - and they do the work for me. This holds true for all interest groups, no matter the issue. Democracy is about individuals being involved in governmental affairs. We are no longer in ancient Athens, where Athenians themselves sat on a hill and voted on each issue themselves where it was a direct democracy. The United States is a republic, which means that we are a representative democracy. We send people to Washington to represent us whether as a Representative, Senator or President. In this same way, we send our other representatives - the "special interest" group of our choice to Washington as well. McCain wants the American people to believe that "special interests" are bad for elections and politics in general. He doesn't doesn't blink an eye when confronted with the little "problem" of the Bill of Rights. He [Michael Graham] also mentioned my abridgement of First Amendment rights, i.e. talking about campaign finance reform....I know that money corrupts....I would rather have a clean government than one where quote First Amendment rights are being respected, that has become corrupt. If I had my choice, I’d rather have the clean government. By limiting monies going into the electoral process by way of political advertisements he believes that the American citizen is stupid and incapable of making up their own mind about what is good for them. Certainly at the worst, he doesn't believe in upholding the Constitution and the Bill of Rights. An important point of clarification here. The Bill of Rights does not bestow its rights on the American people. These rights are "inalienable" and given to us by G-d. The Bill of Rights codifies and protects these rights from government infringement. The concept of the Bill of Rights was seriously discussed during the Constitutional Convention Debates. The first consideration that this review suggest, is the omission of a BILL OF RIGHTS, ascertaining and fundamentally establishing those "unalienable and personal rights of men, without the full, free, and secure enjoyment of which there can be no liberty, and over which it is not necessary for a good government to have the control. The freedom of press was of concern to a Pennsylvania anti-federalist "Centinel" when analyzing the Constitution before a Bill of Rights was included. We must take his words to heart. The framers of it [the Constitution], actuated by the true spirit of such a government, which ever abominates and suppresses all free enquiry and discussion, have made no provision for the liberty of the press, that grand palladium of freedom, and scourge of tyrants; but observed a total silence on that head. The 1st Amendment is not to be trifled with. It is one of the ten building blocks on which this country was founded. The Constitution would not have been accepted without the Bill of Rights. No Democrat or Republican, or even John McCain has the right to trample of the first of these G-d given rights. These rights do not belong to the government to parcel out to whom they choose. And without a doubt it is certainly not theirs to decide who gets to watch what advertisements on television 30-60 days before an election. Quotes for the Pennsylvania Minority and "Centinel" are taken from The Anti-Federalist Papers and the Constitutional Conventional Debates, edited by Ralph Ketcham.